Book Advertisements for Mathrubhumi Instantly! Welcome to Mathrubhumi Newspaper Ad Booking Portal. Use this portal to book any Newspaper Ad instantly online for Matrimonial, Property, Recruitment, Public Notice at the lowest rates. Pay via Credit Cards, Debit Cards, UPI, Net Banking or Cheque. Worried about getting contacts, rates, deadlines and manual booking procedures for your Mathrubhumi classified ads? Your search ends here- Now you can book newspaper classified text and display ads via releaseMyAd - India's largest newspaper ad booking portal. 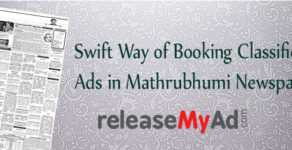 Just 3 simple steps and your ad is booked for the scheduled date.You can avail the best rates and discount packages for your Mathrubhumi classified ads only at releaseMyAd. Get started ! Why advertise in Mathrubhumi Newspaper ? WHY ADVERTISE IN Mathrubhumi NEWSPAPER? Mathrubhumi is among the most widely read newspapers in Kerala, its state of origin. Mathrubhumi is editorially one of the most dignified newspapers, and are responsible for making several significant contributions to Indian journalism. Mathrubhumi’s advertising rates are affordable. You can utilize these ad types by advertising in various categories such as Matrimonial, Property, Obituary, Business and Education. HOW TO BOOK AD IN Mathrubhumi NEWSPAPER? First, select which of Classified Text, Classified Display and Display ads you would like to employ for your ad. Subsequently, choose ad category and location. Compose/Upload your ad material. If you have chosen display ads, but you do not have a creative ready, we can design an ad for you. Finally, select which date(s) you wish your ads to be printed & clear payment via a host of online & offline methods. releaseMyAd’s online ad portal is an integrated newspaper advertising gateway, through which you can get access to the best advertising rates, the most enviable deals, and the most diverse advertising options. 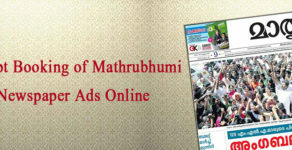 With us, you can book your ads on Mathrubhumi in the form of text classified, display classified and display ads. releaseMyAd has been accredited by the Indian Newspaper Society (INS) as a recognized newspaper advertising agency. Classified Text: Classified text ads are simple text ads that are printed on Mathrubhumi’s dedicated Classifieds page. These ads are very affordable & easy to compose. Classified Display: A lot like display ads, with a few adjustments. These ads allow coloured photographs, company logos, and custom font size, among others. Display classified ads are only printed in Mathrubhumi’s Classifieds page. Display Ads: Display Ads are the most effective variety of newspaper ads. Display ads allow a lot of room for creativity, both in terms of design and placement. Display ads can be placed in almost any shape and in any page in Mathrubhumi and its supplements. To know more about Classified & Display Ads, Mathrubhumi, or about releaseMyAd, click on the appropriate tab above. Classifieds Ad Sections LocationsFAQ Why Mathrubhumi? Want to Advertise in Other Malayalam Newspapers?